HD quality video (1280 x 720) at 30fps. 120° (front) and 140° (rear) 2MP CMOS sensor. Multi-lens to capture video from front and rear. Aside from the rear-camera, the other stand-out feature of the V200HD is the LCD touch screen. At 3" in width, it's the largest screen of any of our dashcams and is unique in offering touch screen capabilities. Despite the screen size, the front-facing camera unit isn't too bulky. Larger than some other cameras, but still small enough to be concealed behind the rear-view mirror. As you may have seen from our unboxing video, the V200HD comes well packaged with all the necessary components to get it up-and-running, including a memory card. The main unit is as small as it can be considering the 3" screen, and is largely black, with ventilation holes around the sides to help disperse heat. On the front of the camera is the lens, surrounded by an LED ring. This glows red when the camera is recording but this can reflect in the windscreen, particularly at night, so thankfully this can be disabled in the menu settings. Apart from that, things are left simple, with three small LEDs on the rear to show you that the camera is powered up, recording and that the GPS has a signal. There is also a microphone and one solitary button that can be used to record manually, which is placed in a convenient position. The touch screen is impressive and makes navigating through the cameras menus a breeze. It's not as advanced as today's smartphones, but the basic touch functionality works very well as is very well suited to the dashcam market. I powered up the camera before installing it to have a play with this unique feature and was flicking in and out of the menus in no time at all. Using straight-forward on-screen icons, navigation was intuitive and there was very little lag, meaning it wasn't frustrating to use. It's a minor detail, but some of the menus have spelling mistakes and grammatical peculiarities in them which hint at the V200HDs foreign heritage, as Winycam originated in Korea. The rear-facing camera is small and neat and connects to the main unit by a long cable. This enables the front, main camera unit to process images from both cameras. This means that when watching your videos, either on the LCD screen or using the software provided, the image can be flipped from front to back easily. This makes it easy to track activity around you as you either pass something of interest, or you get overtaken, for example. Installation was easy, but slightly more time-consuming than some other cameras, due to there being three cables to find homes for. The first cable is for power, and this was simple to run around the windscreen, down the side of the dashboard and under the passenger seat to the cigarette lighter. The second cable was to connect the rear camera, and in my car, a Ford Focus, this was easily hidden behind the edge of the roof liner, the door surrounds and various bits of interior trim. The only minor complication came with leaving enough slack cable for the hatchback to open, but that didn't look messy when the hatch was closed. The third cable is for the GPS unit which is, unusually but not uniquely, separate from the main camera unit in the V200HD. While some people prefer this as it allows the GPS receiver to be positioned where it can get the best signal, it does mean it's an additional unit to mount in your vehicle. I tried this in several positions and it performed perfectly in all of them. Even when completely hidden behind the roof lining, it still captured my location accurately. Mounting the main camera unit was also simple. The adhesive mount features a small ball joint and a tightening ring so it can be secured in place once it has been aligned. Once I had positioned it, neatly behind my rearview mirror, the adhesive stayed in place with no issues at all. The only problem I encountered was that the angle of my windscreen meant that the camera couldn't point downwards as far as I would have liked. This meant that I captured slightly more of the sky than I would have liked to. This didn't limit the amount of on-the-road action that I recorded, but it could have impacted the cameras brightness settings as it dims the overall image to compensate for the light from the sky, resulting in darker footage. One other minor comment at this point would be that the adhesive pad was white, meaning that it was very visible from outside the car. Using black, grey or clear adhesive would have meant that the install was more discrete. The rear camera also mounted easily and neatly at the top of my rear windscreen and didn't block my view at all when looking in the rear-view mirror. Of all the cameras that I've tested, the iPixi V200HD was one of the most reliable and I never had any doubt that it would be working faultlessly. Upon starting it up, a voice message prompted me that "normal recording would now begin", referring to the regular recording mode, as opposed to parking mode for example. At first I would check to see that all the correct functions had kicked in and that the camera was working as I wanted and it always was. Some other cameras, particularly budget cameras, work perfectly and then, for some reason, can throw a tantrum and stop doing what you expect. These complications can almost always be resolved, but they can sew a seed of doubt in your mind. With the V200HD, I never had that. I used the camera daily for over a month, as we feel that to really put a camera through its paces you need to use it over a prolonged period, and never had any issues at all. This peace-of-mind is compounded by the V200HDs 'cut off voltage' feature which means the camera can be left powered while you're away from your vehicle for a long time, but eliminates the risk of it running your battery down completely. It will continue to record, in parking mode, until the voltage of your battery drops to a pre-defined level at which point it will turn itself off. During everyday use, the V200HD recorded my speed and location very accurately with its GPS receiver, identified moments of significance such as heavy breaking or bumps with its G-sensor and switched automatically between the appropriate recording mode depending on whether I was driving or parked. To me, a good dashcam is one that can be installed, and largely forgotten about until the footage is required. I feel that this dashcam is a good example of that. I would say that V200HD isn't designed to be removed from your vehicle once it's been installed. With three cables to disconnect and a mounting bracket that's slightly tricky to reconnect in situ, this camera doesn't lend itself to being taken out of the car overnight, for example. This will suit some people, who see the presence of a dashcam as a security measure, while it will be off-putting to others who may feel that a dashcam is an invitation for a smash-and-grab opportunist thief. Fortunately however, the Micro SD card slot is easily accessible and the card was easy to remove so that footage could be viewed on my PC. Image quality is, without a shadow of a doubt, the most important factor with any dashcam and the iPixi V200HD scores well in this area. It's not the best, and seems to struggle particularly in areas with rapid lighting changes, such as driving though tree shadows for example, but it's perfectly adequate. At standstill, number plates are crisp and sharp but while in transit these can be more difficult to make out, depending on your speed in relation to other vehicles. This is often the case with dashcams and there is a trade off between cameras excelling is some areas of image capture but struggling in others. I think the V200HD has reached a good balance. Most dashcams capture footage at thirty frames per second (fps), delivering smooth video that most people would be very happy with. The V200HD, splits this frame rate between the front and back cameras, meaning that the front camera delivers 20fps and the rear camera, just 10fps. To a tech purist, such as myself, this is a shame, as the footage appears every so slightly jerky. However, it doesn't necessarily have a hugely detrimental effect on the cameras ability to capture the necessary footage in the case of an accident. In order to view your footage in more detail than the LCD screen can offer, you'll need to transfer it to your computer. The iPixi 'WinyBBViewer' software is only compatible with Windows so if you're a Mac user you won't be able to benefit from its features. You can still view your footage, but you won't be able to access the location, speed and g-sensor data that your V200HD has gathered as easily. The software is simple to use and makes it easy to access all the data that you've captured. Videos can be easily flipped between the front and rear view, which really helps to paint a clearer picture of the activity around you, and simple tools for tweaking the image for the best view and for extracting incriminating videos and stills, make it really useful in the case of any incident. 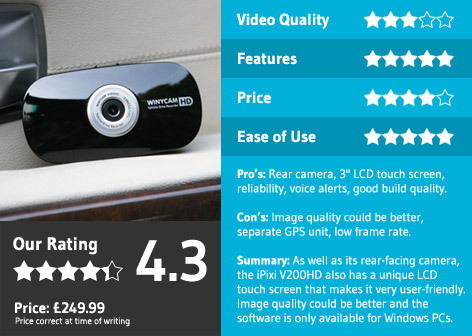 So, if you're after a dashcam with front and rear cameras, which limits you to just a handful of options, you could do a lot worse than the iPixi Winycam V200HD. While the image quality could be better, its many other features mean that it's a very capable unit. The 3" LCD touch screen is a unique and well implemented feature than makes the camera very user friendly, despite the complex featured that it offers, and once it's been installed it can be largely forgotten about without any doubts as to whether it is performing as required. The iPixi V200HD is available to buy online for only £249.99 which comes complete with the rear camera all the accessories you need to install it in your car and get up and running.